It was built when Edward VII was King, in the year the first plane crossed the English Channel and Lloyd George unveiled the People’s Budget. We live in different times, but the Rio Cinema remains synonymous with Dalston after a century of welcoming cinema-goers. This year, it celebrates that milestone by marking the time of its opening with an appeal for the home videos of Hackney residents to be submitted. Opening in 1909, the then Kingsland Palace was just one of five cinemas in Dalston. Today it is the only one in Hackney, a survivor of the widespread decline in independent cinema and a reminder of the fragility of our artistic institutions. The Palace was an immediate success in its day. Hackney’s working class, priced out of theatre visits and with poor transport links to the West End, flocked to the cinemas and music halls of the area. ‘The pictures are always interesting’, wrote the Hackney & Kingsland Gazette in 1910, ‘the humorous and dramatic elements being agreeably combined’. The Art Deco exterior seen today has remained almost unchanged since its unveiling in 1937: a ‘remarkable’ work of ‘sweeping curves’ in the words of Elain Harwood of English Heritage, writing in 1994. It was Grade II listed by the end of that decade. Last Thursday, the foyer was crammed with waiting prams, marking the success of the Parents & Babies screening of Cloudy with a Chance of Meatballs , one of the Rio’s many community involvements. Monthly classic matinees have great success amongst the elderly, and an estimated 12,000 children passed through the doors last year as a result of partnerships with schools. Over its century of existence, the evolution of the Rio has kept pace with the growth of Hackney itself. Interviewed in the 1980s, Robert Morgan, film booker for the Classic chain for much of the 50s and 60s, told of how during that period films were selected for the large black and Jewish communities in the area. By the 70s, the cinema had taken a trashy turn, splicing mainstream movie weekends with blue movies and the occasional horror flick. In 1985, Elizabeth Owen wrote in The Last Cinema in Hackney of her fears for the Rio after the demise of the Greater London Council (GLC), and its associated funding. Today, the Rio is still going strong as a registered charity. Dalston’s local community continues to be well represented by the Rio. Fifteen years ago, London’s Turkish film festival began here, and will return in November for its latest run, having spread to multiple London venues. The cinema’s Call for Home Movies has received extensive submissions, uncovering a rich vein of documentary footage. Submitters will have the ‘opportunity to watch their history’ says Jemma Buckley, who is running the project for the Rio. Archival film has come in from Hackney residents from far flung places, including Trinidad, Poland and Nigeria. Those involved may have had the film for generations but never the projectors required to play it. Film directly related to the borough will be added to those held in the Hackney Archives and shown to the public in a series of January screenings. 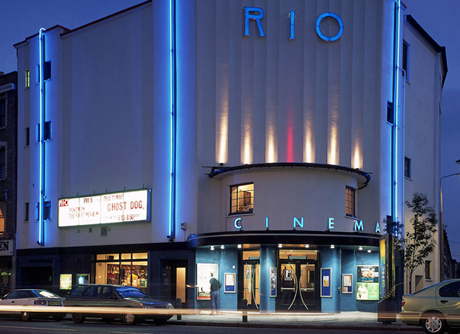 To get involved, contact Jemma at the Rio: email jemma@riocinema.org.uk or phone 020 7241 9419.